Oil level (if necessary, replace existing oil with a winter grade oil or the SAE 10w/30 weight variety)Install good winter tires. Make sure the tires have adequate tread. All-weather radials are usually adequate for most winter conditions. However, some jurisdictions require that to drive on their roads, vehicles must be equipped with chains or snow tires with studs. 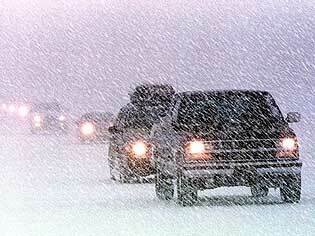 Listen to the radio or call the state highway patrol for the latest road conditions. Always travel during daylight and, if possible, take at least one other person. If you must go out during a winter storm, use public transportation. Contact your local emergency management office or local American Red Cross chapter for more information on winter driving. Stay in the car.Do not leave the car to search for assistance unless help is visible within 100 yards. You may become disoriented and lost is blowing and drifting snow. Definition: "Wind chill" is a calculation of how cold it feels outside when the effects of temperature and wind speed are combined. A strong wind combined with a temperature of just below freezing can have the same effect as a still air temperature about 35 degrees colder.